May 26, 2016 – Replicating the thunderous noise of a rocket launch is no easy task, but engineers at NASA Glenn’s Plum Brook Station in Sandusky, Ohio are mimicking the launch environment the Orion spacecraft will experience on a 2018 mission beyond the moon. 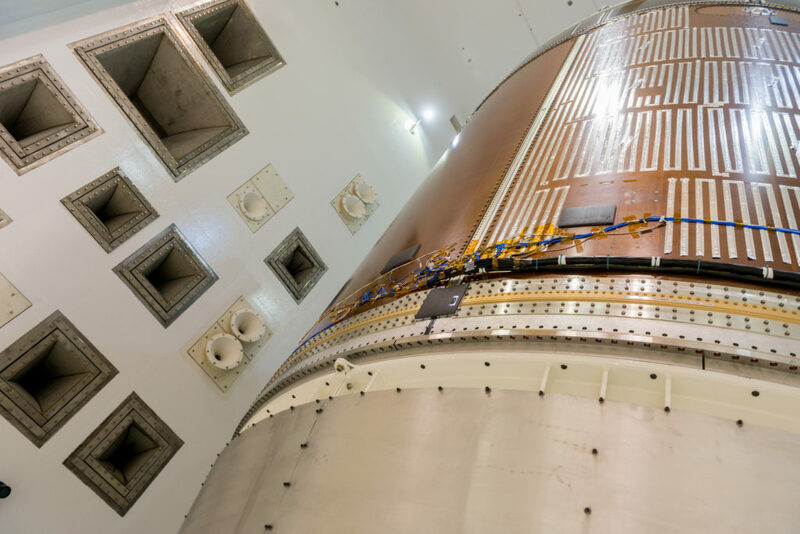 They recently concluded a series of tests on a structural representation of the Orion service module to help ensure it can withstand the force and pressure of the acoustics environment it will experience as it makes its way from the launch pad to space atop NASA’s Space Launch System rocket. Orion’s service module is a critical piece of the overall spacecraft. Provided by ESA (European Space Agency) and built by Airbus Defence & Space, the 13 ton component will be responsible for propelling, powering and cooling the vehicle, as well as providing air and water for its eventual crew. When a powerful rocket launches, it can produce noise of up to 180 decibels, levels so high that it can vibrate and damage spacecraft components if they aren’t designed and built to be strong enough to withstand the environment. For comparison, a person standing about 325 feet away from a jet taking off would experience approximately 130 decibels of sound pressure, and for every additional 10 decibels, sound intensity increases 10-fold. While engineers have designed Orion components to endure a range of harsh environments like launch and missions in space, testing on the ground helps to validate computer modeling predictions. “Orion is undertaking an unprecedented mission, so the acoustics testing we’ve done is helping us make sure the service module will fare as we expect it to,” said Aron Hozman, lead engineer for the acoustics testing campaign. Engineers performed numerous evaluations at different decibel levels over the course of several weeks in Plum Brook Station’s Reverberant Acoustic Test Facility. The facility is the world’s most powerful spacecraft acoustic test chamber. In it, a series of modulators or horns embedded on one of the facility’s walls and supporting subsystems such as a gaseous nitrogen generation system and a hydraulic supply system were used to modulate noise and produce a wide range of acoustic spectrums. The series of testing was done in two configurations – one with “wet” tanks where the service module’s propellant tanks were filled with a simulant that modeled the density of Orion fuel, and with them empty to determine if the noise affected the structure differently. The maximum test with fuel simulant lasted approximately three minutes. Engineers also used the testing to help qualify the service module’s solar array wing. They placed a microphone inside the test article and determined that the noise in the test chamber matched the expected acoustic environment inside the service module where the wing is housed. The service module structural test article will next move to Plum Brook Station’s Mechanical Vibration Facility, a powerful spacecraft shaker system that will help assess the component’s ability to withstand the tremor that an SLS launch will produce. As these ground tests continue to validate the service module’s design, the first flight unit service module for EM-1 is now being built in Europe. This unit, which will be built by the same teams who built the structural test article, recently arrived to Airbus’ facility in Bremen, Germany for integration. It is expected to be shipped to the United States in 2017. Lockheed Martin in Littleton, Colorado is the prime contractor for the Orion spacecraft. Orion will be coupled with the European Service Module to carry astronauts into deep space.